Designer: Beulah Cooley is a Native of Philadelphia, Miss. moved to Detroit, MI. in 1977. Beulah has been designing clothing since she was a child. Using her dolls as models, she began sewing in the eight grade and making her own wardrobe. Cooley previously worked at Bobbie Brooks Mfg. Co. in New York City, and Barney`s men shirt Mfg. co. , Meridian, Ms. also McFain Mfg. co. Pachuta, Ms. were one of the companys was a contracker to manufacture the Blue Jean Denim Line, for Jc. Penney`s, Working as a sewing machine operator for these Manufactures co., enabled her to gain experience that enhanced her God-given talent alone with taking classes in Art Illustration at Oakland University. Mi. 1978: Beulah began catering to a select clientele which attracted others to her unique designs. 1983: "Beulah's Designer Fashion" was established, and she gained recognition as a fashion innovator. She appeared as a winner in fashion competitions, on local television and as one of the top ten designers nationwide in the International Design Competition sponsored by "Canadian Mist Designers of the Future". 1992: One of her designs was declared a winner and was on display in the Black Art Museum in New York City. 1993: Beulah Cooley created an unusual line of Denim Peplum Suits with French Cuffs and Covered Buttons. Cooley loved to work with unusual fabrics. She created a line of treaded Burlap Suits lined with silk, form fitting Suits with French Cuff and Rhinestone Buttons to accent the Burlap to give the BEULAH COOLEY COLLECTION, It's Signature style that She is known for. Her Designs range from conservative to high fashion to fit a Woman needs. The Cooley Collection are available online and in boutiques in surrounding area of metro Detroit, Chicago, Memphis, and other states to name a few. 2002: The Detroit City of Detroit presented Beulah Cooley with a Testimonial Resolution. 2004: Charles H. Wright Museum of African American History/ Detroit, Mi. Presented A unusal Brass and Glass engraved Trophy In Recognition for Her Accomplishments as A Nationally Know Fashion Designer. 2005: "THE MARCH OF DIMES FASHION EXTRAVAGANZA" at the Burton Manor in Livonia MI., Beulah Cooley showcased a collection of rainbow colors of treated Burlap alone with the natural color Burlap line with Silk organza easy to wear. There was an overwhelming response from The audience, customers, media, and sales elevated. The Terated Burlap line is the #1 seller and has sold from east to west, north to south and are still in demand. 2006: The Beulah Cooley Collection Models "Rocked the Runway" at The Detroit Fashion Week, hosted by Brian Heath. With her beautiful designs were showcased on the Front Page of the Michigan Chronicle. 2007: The Beulah Cooley Collection was back again at The DETROIT FASHION WEEK. News papers and magazines were inquiring to find out if the Cooley Collection would be showcased in the show. Later, The Crain News called DFW to Eexclusively Shoot THE BEULAH COOLEY COLLECTION. And indeed they did just that, A Personal Photographer to Capture every Backstage and Onstage Moment with this Creative and Unique Designer. 2008: DETROIT FREE PRESS, Fashion Writer Cassandra Spratling chose four Local Designers to dream Big and create a gown for Michelle Obama for the inaugural balls. Beulah Cooley was one of the four designers whose creation and article appeared in the newspaper on the front cover and in color, head line reading --Local designers dream big, outfit Michelle Obama for Inaugural Ball. 2009: at the March of Dimes Fashion Extravaganza, Beulah Cooley Collection was the highlight of the show as she showcased her Spring Collection of linen. Models dressed in halterback jumpsuits, shorts sets and sleeveless dresses, just to name a few of her beautiful designs hitting the runway. Beulah Cooley is a long time volunteer of the March of Dimes Foundation and Served as the Fashion Coordinator for seven years. 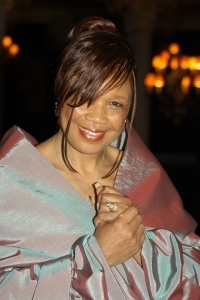 2009: Beulah Cooley was one of many guest at THE DON DAVIS (A Motown Music Veteran) 70th Compostion Tribute Scholarship Award Gala. Cooley arrived wearing one of her own Couture Elegant Gown, Red carpet, Hollywood Style with cameras flashing, many heads turning. Articles have appeared in local and national newspapers and magazines applauding her unusual talent and the ability to create designs that derive from meticlous selections of fabrics and an exceptional ability to create an original that affords unparalled excellence in dress for the wearer. 2011/12; Beulah Cooley Collection on The Front Cover of B.L.A.C. Magezine, Ferndeal, Mi. 2013: A Two Page Spread and More All New GOSSIP MAG./ Westland , Mi. 2014: BRING BACK SUMMERTIME; Movie Production Wardrobe Designer and Consultant. 2014: Cooley are currently looking for Space to Expand the Business, to continue catring to long time Customers and New Clientele, also offer Sewing Clesses to Young up and coming Fashion Designers, Cooley and staff do believe Young People are our Future. One who wears a BEULAH COOLEY COLLECTION original design experience a "Clothes Encounter" of the Best Kind! !